Pushing the line, planning an escape. Like whispers in the wind. Permanently impressed on the frame of the stars. 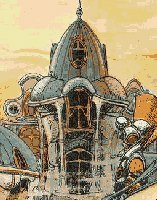 The palace is from a painting by Enki Bilal. The scrolling text is from "Get 'Em Out By Friday" by Genesis, 1972.